Boondocker has won six First Place ribbons! absolutely breathtaking, absolutely beautiful! Impressive histogram to boot. 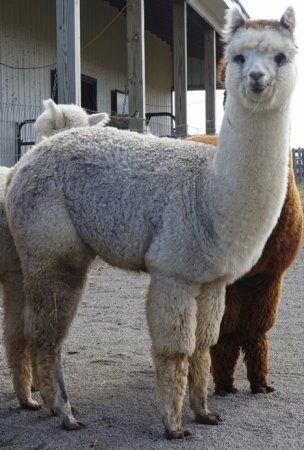 At a young age, he is a sizable alpaca, and has shown interest in breeding. Boondocker's sire is a champion winner who is another carbon copy of the amazing Legend's Challenger of KPR. Boondocker genetics on his dam's side comes with fantastic density. 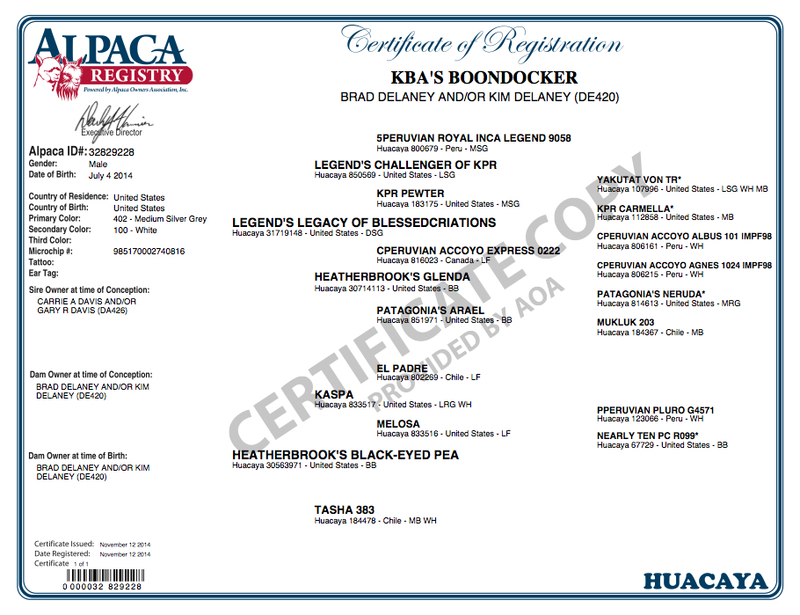 His dam was sired by Patagonia's Kaspa and her grandsire is El Padre. Boondocker is a pleasure to work with and is very well mannered. 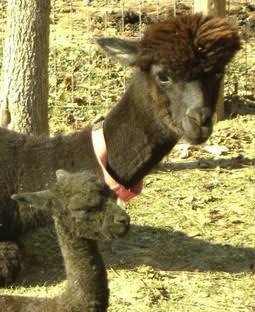 Fabulous on a halter. Boondocker would be sold with retained breedings. Spinning Criteria Highlights: Uniformity of Length, 4 out of 5. Uniformity of Micron, 4 out of 5. Ease of Carding, 5 out of 5. Ease of Drafting, 7 out of 8. Ease of Spinning, 8 out of 10. Degree of Production Loss, 4 out of 5. First Impression, 5 out of 6. Usability, 6 out of 7. Brightness/Luster, 5 out of 6. Handle, 5 out of 6 possible points. Spinning Criteria Highlights: Ease of Carding, 7 out of 7. Ease of Drafting, 4 out of 5. Ease of Spinning, 8 out of 10. Degree of Production Loss, 4 out of 5 possible points. Fiber Criteria Highlights: Uniformity of Micron, 6 out of 8. Uniformity of Length, 7 out of 7. Uniformity of Color, 5 out of 5 possible points. 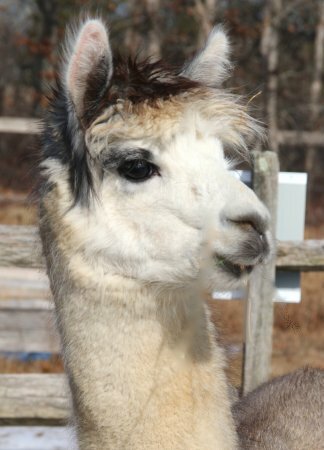 2016 Big E Alpaca Fleece Show judge Arturo Pena commented: "Good uniformity of length and color." 2016 MAPACA Jubilee Spin-Off judge Diana Timmerman commented: "Brightness!! Such a pleasure to card! Locks opened very easily, made large, lofty batt. Lovely to spin! Great elasticity. Nice all purpose yarn." Fiber Criteria Highlights: Uniformity of Length, 5 out of 5. Uniformity of Micron, 4 out of 5 possible points. Spinning Criteria Highlights: Ease of Carding, 5 out of 5. Ease of Drafting, 7 out of 8. Ease of Spinning, 10 out of 10 possible points. Finished Product Criteria Highlights: 1st Impression, 5 out of 6. Handle, 5 out of 6 possible points. Fiber Highlights: 1st Impression, 5 out of 5. Uniformity of Length, 5 out of 5 possible points. Spinning Highlights: Ease of Carding, 5 out of 5. Ease of Drafting, 7 out of 8. Ease of Spinning, 9 out of 10 possible points. Finished Product Highlights: First Impression, 6 out of 6. Usability, 6 out of 7. Brightness/Luster, 6 out of 6. Handle, 6 out of 6 possible points. 2016 Southern Select Spin-Off judge Judy Keske commented: "Nicely defined. Easy to align staples. Flicks open freely. Drafting is smooth and effortless :) Wonderful to spin. Lofty." Fleece Score Highlights: 1st Impression, 4 out of 5. Ease of Carding, 4 out of 5. Ease of Drafting, 7 out of 8. Ease of Spinning, 9 out of 10. First Impression of Yarn, 5 out of 6 possible points. 2016 TXOLAN Spin-Off judge Roo Kline commented: "Loving the silky, squishy handle and crisp grey color. Micron consistent. Very easily released when locks were teased open. Wow!! Soooo smooth! Lifted off the drum so neatly that I'm sure no hair was left behind! :) Beautiful, smooth drafting. Lovely yarn! Squishy, soft to the touch." Fiber Criteria Highlights: 1st Impressions, 5 out of 5. Uniformity of Length, 5 out of 5. Spinning Criteria Highlights: Ease of Carding, 5 out of 5. Ease of Drafting, 8 out 8. Ease of Spinning, 10 out of 10 possible points. Yarn Criteria Highlights: First Impression, 6 out of 6. Brightness/Luster, 6 out of 6. Handle, 6 out of 6 possible points. Boondocker scored a 91/100 with his fleece! Fantastic! 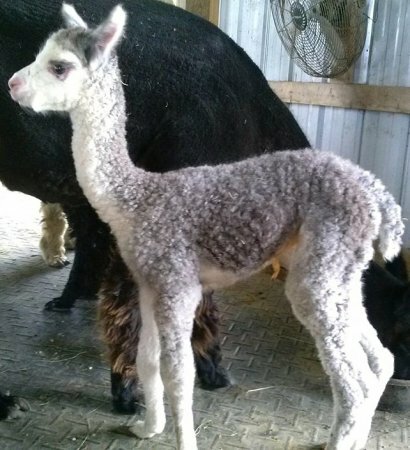 2015 A-OK Blast Off Fleece Show - Judge Sara Jane Maclennan commented: "Good weight!" Fleece Score Highlights: Length, 6 out of 7. Color, 5 out of 5 possible points. Another carbon copy of the amazing Legend's Challenger of KPR! 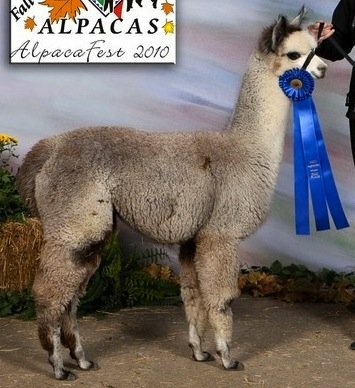 "Jack" started his show career this fall attending his first show only days after turning 6 months old. 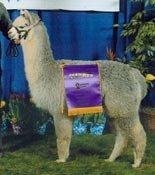 He is turning heads with 1 Reserve Champion, 2 Blues, 3 Reds, 2 Whites, and 2 Yellow. All of the judges commented on his impressive staple length, fineness, density, and uniformity. The only thing holding him back was his size (the youngest in the class at all shows). 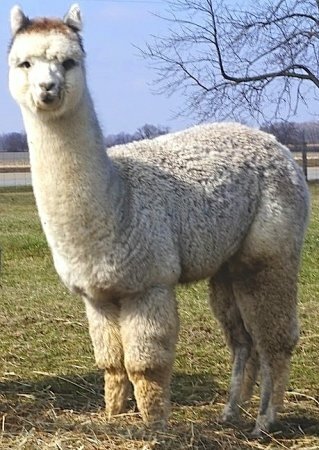 He placed higher in a walking fleece competition than the first place winner in his class proving his fleece is superior. Wade Gease, AOBA Judge, commented positively on all the above judge's comments and added, "He will be exciting to watch as he matures!" and "Deserving of his ribbons. You should see more as he matures." Jack is proving his ability to improve fineness and consistency in his offspring. 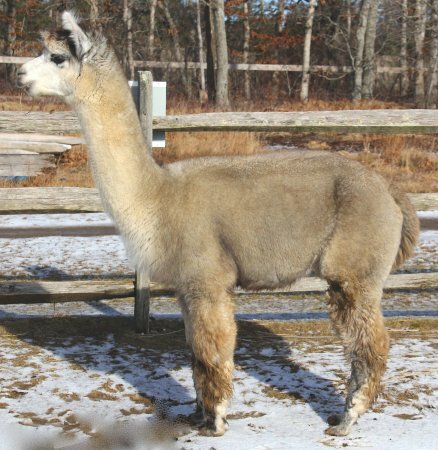 We expect a color similar to the dam with Jack's fineness and consistency exhibited in their fleeces. 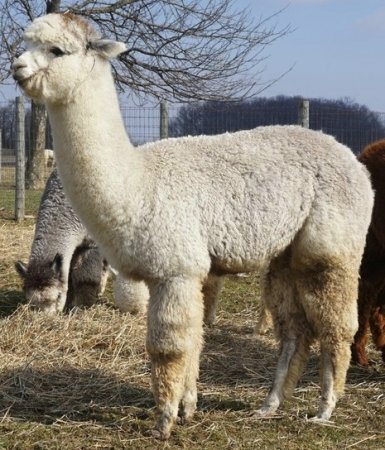 Jack's own fleece is still a grade 2 fleece at 4 years old and several cria on the ground!